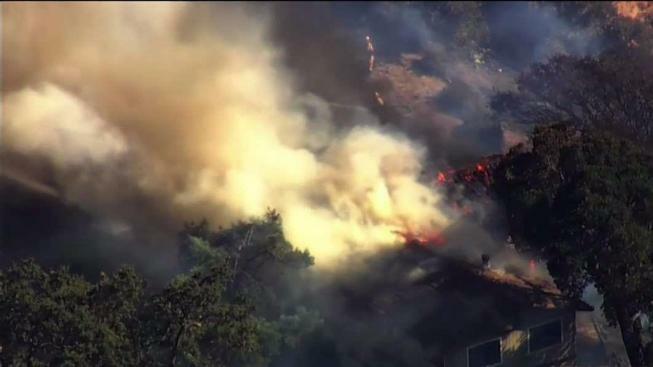 Fire crews in the South Bay have been busy all week and remain on high alert now that inspectors have raised the possibility that some fires have been set intentionally. Firefighting crews have been stretched thin the past couple of weeks, with each shift going from one fire to the next. At Station 2, one of the busiest fire stations in the South Bay, it’s been nonstop for the men and women inside. Two days after the fire at Alum Rock Park, crews were still on the scene, putting out any potential hot spots. The fire burned 101 acres and was 100 percent contained by Thursday afternoon. At least 10 other fires have burned within a mile of the park over the past two weeks, and fire crews are feeling the heat. "That’s just physically and emotionally exhausting for firefighters," firefighters union president Sean Kaldor said. Kaldor said some of the fires could be the work of an arsonist in the East San Jose foothills, and he fears another arsonist is active in the area known as The Jungle, a former homeless encampment. "We’ve had multiple fires in San Jose that are really taxing us," he said. "The Jungle area has had multiple fires in a single day. We can have three or four responses there. We’ve had so many fires like that." Multiple suspicious fires in one area, some almost simultaneous, point to a high possibility of arson, Kaldor said. And that means more work for an already tired and understaffed fire department. "The major events right now, they’re really strapping our thin resources," he said. "We’re understaffed to handle these events." Kaldor said the fire season is just starting, and his men and women are already exhausted. Unlike other years, he said, they don’t even have the staff to go out and warn people in the hills about creating defensible space around their homes. The firefighters union says they’re asking Cal Fire for help, and Cal Fire is asking them for help across the state. Cal Fire says 95 percent of fires in California are started by humans.